Dear friends, today is a joyous day for everyone in Softinventive Lab! We used all the monumental experience and knowledge we’ve accumulated over 10 years, thought long and hard, argued, developed plans and finally created a completely new product for you, system administrators. This is our vision of what an ideal administration tool should be. Network Olympus. What should a first-class product for sysadmins be? The idea of creating Network Olympus didn’t come to us overnight. All the experience we’ve gained while working on Total Network Inventory, Total Software Deployment and Total Network Monitor has led us to desire to create a more flexible, versatile, all-in-one product. It’s designed to combine all our previously developed features in one project with a convenient web interface. Network Olympus is being created under the slogan: “Simplicity and efficiency”. You don’t need to grapple with the program for long hours and days, watch training videos and talk for hours with the support team. A simple, intuitive, straightforward interface lets you quickly become familiar with all the available features. You can see for yourself today. Control over the operation of key elements of the corporate network is one of the top priorities for a system administrator. For the most effective solution of such problems we have created a monitoring module. Network Olympus is effective and concise from the first minutes! The basic logic is pretty simple: device – sensor – notification – action. That’s how it works: quick and efficient. Are you looking to create your own custom logic for sensors and actions? 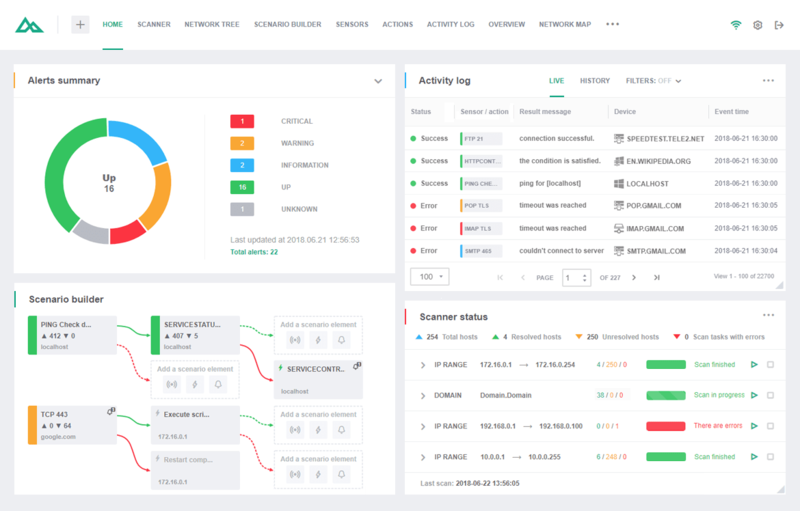 Welcome to the scenario builder, the centerpiece of Network Olympus: Monitoring! It is here where you can create various logic chains, as well as connect checks, actions and notifications with each other. Does it take much effort to do this? Not at all! Creating scenarios doesn’t actually require writing scripts. All logic chains are visualized and can be altered at any moment in just a few clicks. Unleash your imagination and automate the problem solving in your corporate network. Network Olympus will itself restart the service or server, launch the desired application, or simply remind you of a friend’s birthday and send congratulations by e-mail. The possibilities are truly limitless! All the stats for each check, action and notification are collected with precision by the program and stored in the activity log. At your service is a detailed history of events, all kinds of filters and the ability to manage sensors directly from the log. For easiest perception, all devices and connections between them can be promptly displayed on the network map. Easy deployment: everything you need to get started right away is already in the installer. You will immediately get access to the full functionality of Network Olympus: Monitoring after the installation is complete. Ease of use: end-to-end navigation, panels customizable for your needs, rapid transitions and the ability to edit any elements you’ve created from anywhere and at any time. Web interface: gain access to the program from any stationary or mobile devices wherever you are! Take part in beta testing and receive gifts! Your feedback is very valuable to us. Everyone who actively participates in the beta testing is guaranteed a gift in the form of a free license! Looking forward to testing the beta version been waiting for this for awhile. Thank you for taking an interest in our product. How can I take part in beta testing? I download beta version and try it now. You can download the beta version via the link above and provide us with your feedback. Please tell us what you think or what can be improved. You can use the feedback form in Network Olympus. Is there a web form that I could use as an alternate method to provide feedback? I like softwares of softinventive, simple, fast and objective. I used for a long time TNM 1, about 2 years, its a bull. I’ll test now the Olympus and see how does it work. Thank you for trusting our products.